A High Court judge has waived an anonymity ruling, to help find a missing three-year-old boy. Mr Justice Williams said he had "grave concerns" for Olly Sheridan, who has been missing from Basildon, Essex, with his mother since July. Ellie Yarrow-Sanders, 26, is embroiled in a custody battle with Olly's father, Patrick Sheridan, who said he was "desperately worried" about his son. Journalists have previously been barred from identifying them. The judge said he was so concerned about Olly's safety that he had decided to make him a ward of court - meaning the responsibility for him lies in the judge's hands. Mr Sheridan, who is a civil engineer in his 40s, is being represented in court by Irwin Mitchell. 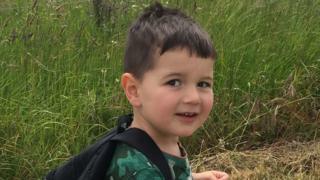 A spokesman for the law firm said Olly and his mother disappeared shortly before Miss Yarrow-Sanders was due to give evidence at a "critical" court hearing in Chelmsford in July. He told how attempts to find the pair had proved "fruitless" and Miss Yarrow-Sanders had defied orders to return Olly. Speaking after a hearing at the family division of the High Court, Mr Sheridan, said: "My message to Ellie is simple: 'Please come back so we can see Olly's all right'."